The overstuffed fresh lobster roll at Five Islands Lobster Co., Georgetown, Maine, on July 5, 2018. I had first attempted to eat lobster in May of 1991 at a popular seafood restaurant on the east coast. I won’t say which restaurant, as it’s still open at the time of this writing and they’re still serving lobster as they always have to happy customers. But to say that I was sorely disappointed is an understatement. I had no idea how to open the thing as it didn’t come with instructions, and the meat was not only a bit tough but rather rubbery as well. The flavor seemed “off”, not being anything like any crab I had ever eaten of any variety, including Chesapeake Bay blue crab, Opelia, or King. I decided lobster is nothing more than an expensive way to eat melted butter. I wasn’t about to give up though, and as time went on I attempted to enjoy lobster every chance I got. I rarely got back to the Atlantic shores very much so most of the lobster I tried was in the midwest. The classic preparation in the Michigan or Ohio is that of grilled lobster tails. They’re rarely fresh there, being processed and frozen raw on the coast before being shipped to frozen food distributors. At larger gatherings and restaurant buffets where they offer a “lobster bake” the lobsters arrive already boiled, packaged in individual nylon nets. They’re then thawed, the nets are removed, and the whole lobsters are boiled quickly for about another four minutes before serving. The New England Roll Special with Tarragon on Brioche at a restaurant in the midwest, as seen on Facebook on July 6, 2018. This isn’t a New England Lobster Roll, regardless of what the Chef says. What this does is disrepect the lobster as the main ingredient, elevates the roll itself to a bread New Englanders wouldn’t use, confuses people who know what a real New England Lobster Roll is, and presents an inaccurate version of the dish to patron who have yet to experience the authenticity of the New England Lobster Roll. This kind of situation is why I hadn’t yet been able to enjoy the real article. 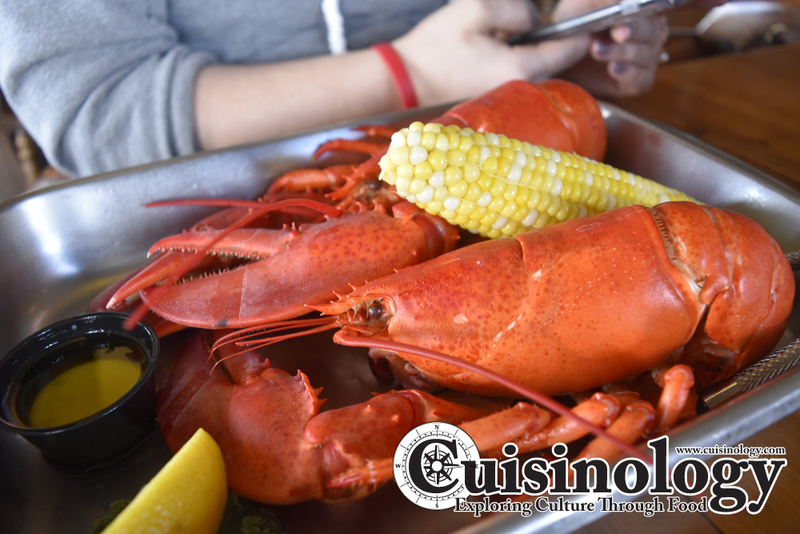 It wasn’t until we ended up in Maine for six months beginning in April of 2018 that I finally had the opportunity to try fresh local lobster that had been cooked in a kitchen specializing in northern Atlantic seafood. The first full day we were there we ended up at the Taste Of Maine restaurant in Woolwich, where our daughter proceeded to order two whole lobsters. Our daughter’s two whole lobsters at the Taste Of Maine restaurant in Woolwich, Maine, on April 21, 2018. With a lot of their patrons being from out-of-town or out-of-state the restaurant’s placemats give detailed instructions on how to break down a whole lobster. Once we followed the instructions, along with some good hints from our server, we all tried it. The difference between any other lobster I’ve tried and the meat from those two animals from Maine waters that had also been cooked nearby in a Maine restaurant was rather eye-opening. The meat was sweet and moist, very tender, and had a rich flavor that I felt had been missing in all the other dishes I’d attempted to enjoy for almost thirty years. The cuisinologist in me hadn’t given up on multiple preparations of this same or similar dishes, and my determination was firm in continuing the quiet mission of trying to find out what was wrong, why I hadn’t been able to enjoy such a popular meal. And it paid off, right here in Maine. Five Islands Lobster Co., Georgetown, Maine. Try your best to avoid using frozen raw lobster. Get the freshest live lobster possible, less than about 72 hours after it was landed on the lobster boat. If you’re not near any lobstermen, your best bet is to have live lobster overnighted from the coast. If it’s been in a tank for a while, especially a tank that doesn’t contain real seawater, it’s not worth it. Check the color of the shell and make sure when you squeeze the sides there’s a little bit of “give”. If the live lobster has to sit at all before cooking, ensure that it’s in well-salted clean room-temperature water for as short a time as possible. Do You Boil It Or Steam It? Either enjoy it immediately, or pick the meat immediately and chill it for making lobster rolls. If making lobster rolls, make sure to use the correct bun. 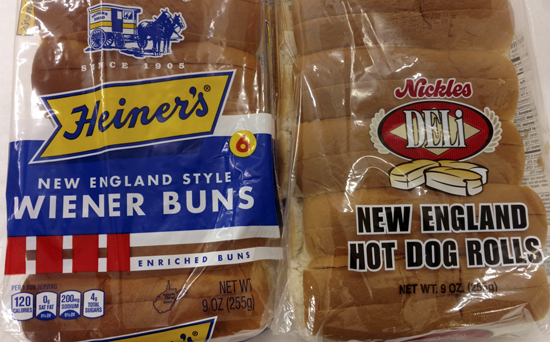 In New England it’s called a Frankfurter Bun (above, right, compared to hot dog buns at a Hannaford grocery in Maine), but in the rest of the country it’s generally known as a New England Roll (below, in a Piggly Wiggly in southeastern Ohio). As the summer progressed I enjoyed lobster rolls in a number of restaurants and, more importantly, at roadside lobster shacks where things have generally been done a certain way for a very long time. 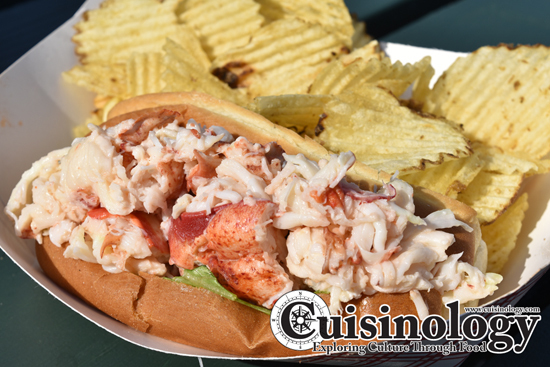 The first lobster roll I had was at Red’s Eats in Wiscassett on May 2nd during the stand’s 80th anniversary year. Red’s has been popular in the area the entire time they’ve been open but have seen even more business since showing up on a food and travel show called “The Zimmern List”, on the Travel Channel in 2017. Many lobster rolls I had seen weren’t half as stuffed as the one I was served at Red’s. But the one at Red’s was considerably better than I had imagined such a thing could be. It came with sides of mayonnaise and melted butter, and I decided the butter was the way I wanted to go with it. That was definitely a good decision as the butter enhanced the flavor the way it should have on my first lobster thirty years before. One of the interesting aspects of the lobster roll at Red’s Eats is that each one includes the meat from one whole tail and two whole claws, along with a literal handful of other picked meat. Detailed in the restaurant’s own book, Debbie Gagnon Cronk, Red’s daughter, the current owner and the face customers see at the shack’s window, was quoted as saying “If you want to cook and pick your own lobster meat, plan on 1 – 1-1/2 pound hard shell lobster or two to three 1 – 1-1/4 pound softshell lobsters per roll. (Do not use frozen lobster meat; that is a sin. )” [Cronk, Debbie Gagnon; Wright, Virginia. Red’s Eats: World Famous Lobster Shack. Camden, Maine: Down East Books, 2010, page 25]. Topping such a great lobster roll is no mean feat, but a couple months (and a number of lobster rolls) later I found the one I believe to be the best. Five Islands Lobster Co. near Georgetown, Maine, isn’t too far from Red’s Eats and was also represented on the same episode of Zimmern’s show on the Travel Channel. 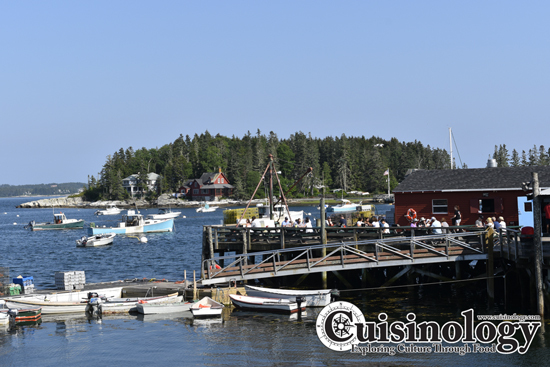 The setting of the Five Islands Lobster Co., showing one of the three outdoor dining areas. The open ocean is just beyond the islands. 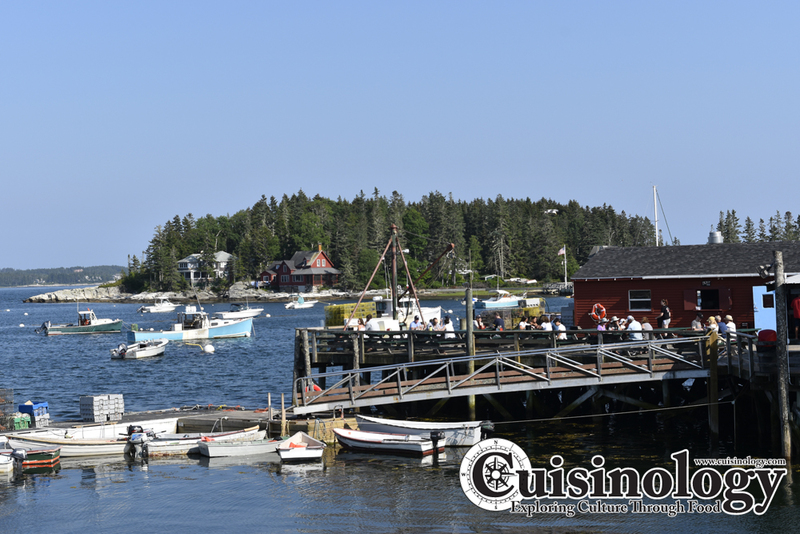 Five Islands is probably the freshest lobster shack in the area while also likely being the most fun. 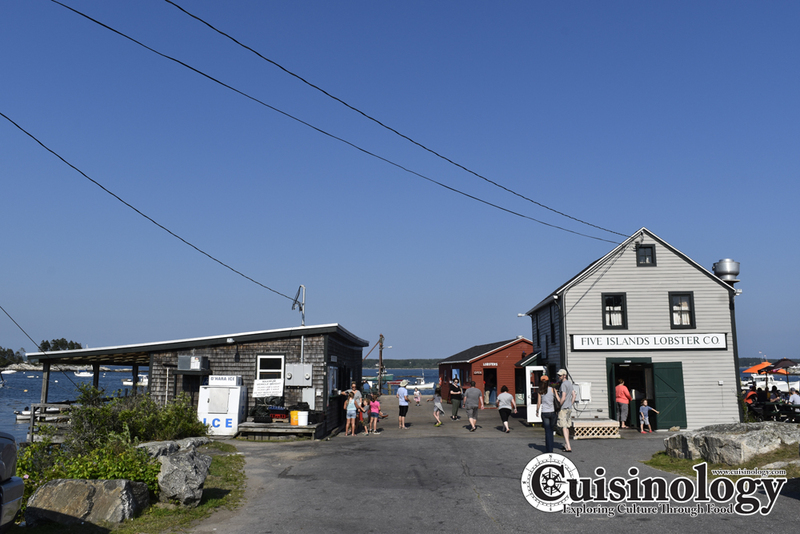 Located on a picturesque man-made peninsula in the Sheepscot River, there’s parking for dozens of cars and picnic table seating for at least a hundred diners. Five Lobsters is made up of three buildings. 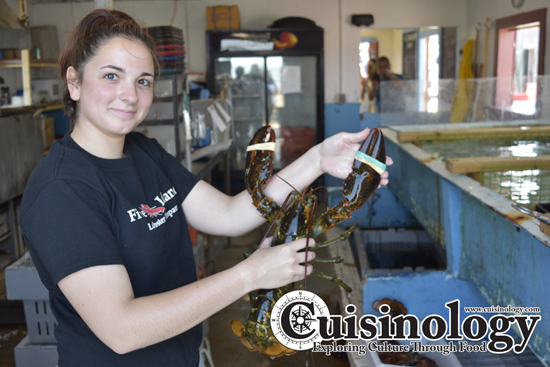 The farthest is the lobster building, where lobsters from the surrounding waters, along with other shellfish such as steamers and mussels, are prepped from live to either direct sale to customers in to go containers or as baskets to eat on-site. 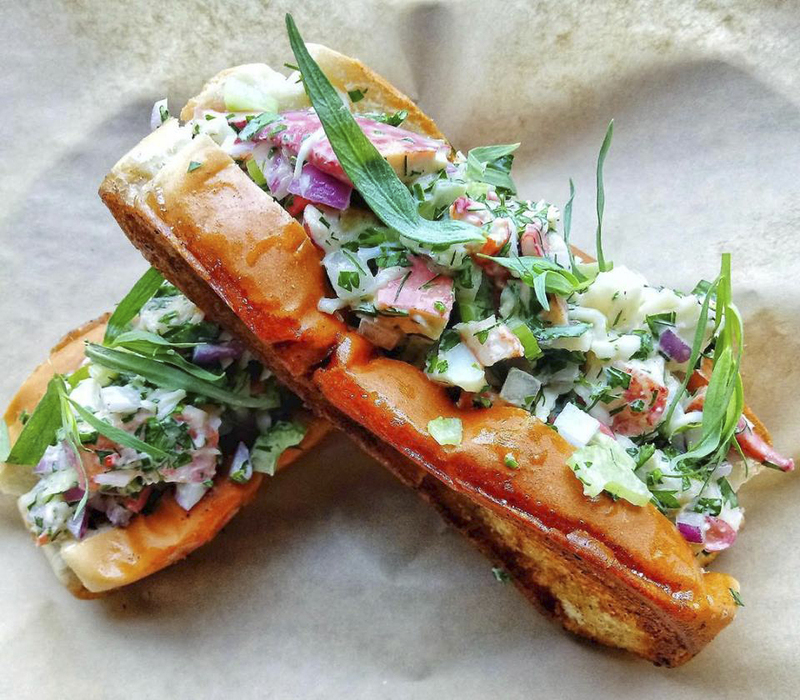 The “Love Shack” grill building offers the sweet and overstuffed lobster roll shown in the fist photo above, as well as other seafood preparations, burgers and sandwiches, and many other items. And the ice cream building offers desserts made of local products. Wandering the rocky shoreline nearby is also allowed, it’s only the active boating docks that are private and off-limits. The overall view, past Malden Island, Hen Island and Mink Island to the open ocean, is simply breathtaking. A look into the kitchen at the lobster building at Five Islands Lobster Co. Note the bright unmuted color of the lobster’s shell, indicating the live animal’s freshness. The difference between the lobster on the lobster roll at Red’s and at Five Islands is only a matter of what’s probably only a few hours in preparation, but there are enough differences in the characteristics of the lobster meat on the roll that the latter is the one I chose, even though I’ll also enjoy a lobster roll at Red’s Eats any chance I can get. Authenticity matters. Recreating a dish like this with a personal flair to make it seem “high-end” so it fits a restaurant that’s not a lobster shack is disrespectful of the main ingredient, in this case the lobster, and does nothing to create an accurate representation of the named dish. Presenting such a dish the right way is the right thing to do. It’s what people who know the original dish expect, and it teaches accuracy to patrons who are unknowing of the original dish. 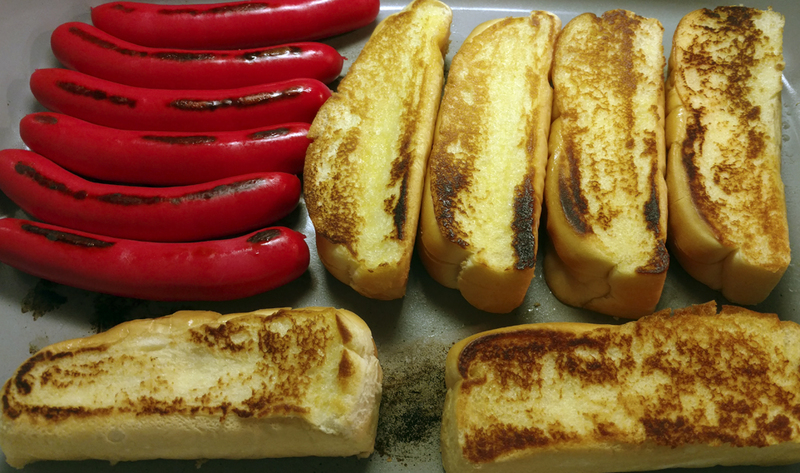 Franfurter Buns in Maine in my electric skillet with traditional Maine red hot dogs. This is how the buns should be prepared for lobster rolls. The classic recipe is quite simple: It’s two cups lobster meat, cooked, chunked and chilled, folded with two tablespoons mayonnaise, and if desired ¼ cup finely-chopped celery. 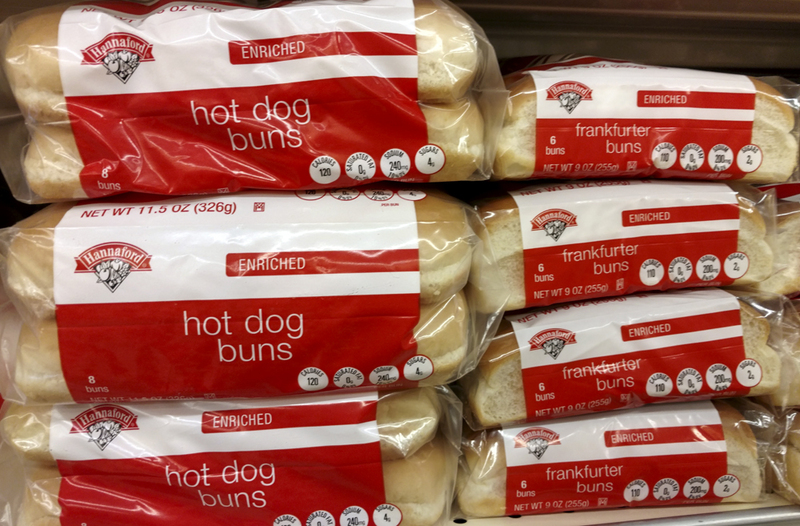 Butter and grill four frankfurter rolls (what the rest of the country calls a New England roll, a split hot dog bun having flat sides), maybe add one leaf of lettuce, then stuff the roll with the lobster meat mixture and serve. Excellent article, Dave. I could taste the lobster as you described it and could even smell the salt water of the ocean!